We are being given the opportunity, right now, to return this country to a democracy with one vote per person- something that has not been in effect for a very long time. The biggest reason to elect Bernie Sanders as President of the United States is to reform campaign finance; taking the power away from big money, and returning it to the citizens of this country. Otherwise, America will remain a plutocracy, ruled by the wealthiest individuals and large banks and corporations. Major policies have not changed regardless of whether a Democrat or Rupublican has held office because the powers that elected them have controlled their actions in order to serve their own (monetary) interests. While amoral practices have been allowed, it has been the hard working middle and lower classes of Americans who have suffered. By refusing money from a Super Pac or large corporation, Bernie Sanders is now returning the power to the individual citizens of the US. What he has done is nothing short of a political revolution. Over one million people have already contributed to his campaign (many numerous times), with an average donation of just $27! I was one of them. Despite not coming anywhere close to being able to pay my monthly bills for the past three years, I wanted to give his campaign a small donation to at least add my voice and show my support. Together, we can make a difference! Sanders has given many people the interest in participating in politics for the first time in their lives because they finally feel that they have a say. He has amassed a huge following of new voters, and without the support of his party leaders or billionaires who back Clinton, he managed to tie her in the Iowa caucuses, building momentum for his campaign in future states. (The voting in Iowa was so close, that 6 precincts were decided by a coin toss- all won by Clinton, even though that result is 98.4% improbable!). 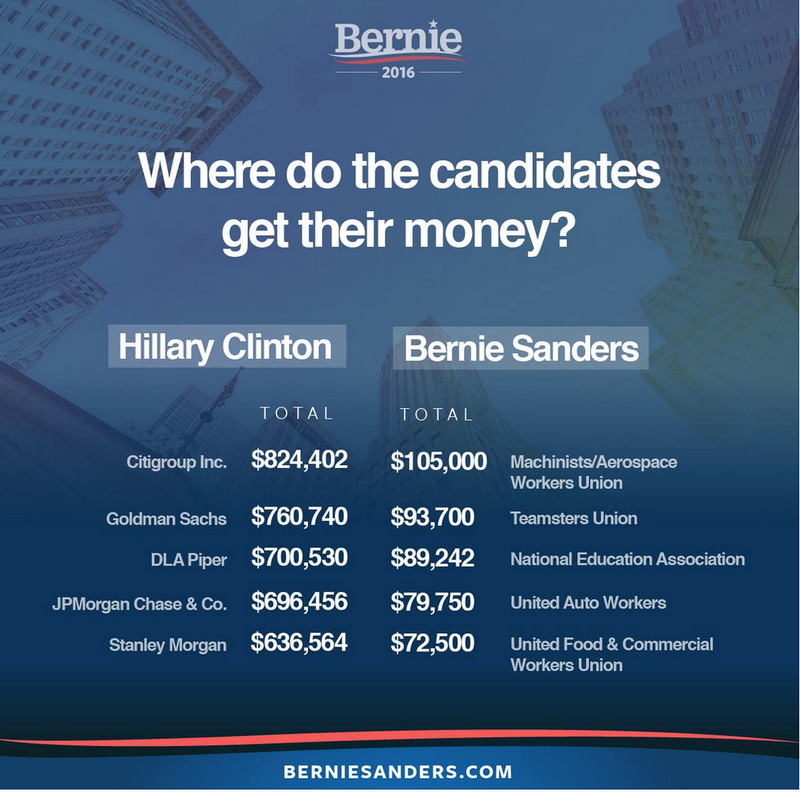 There are many ways to support Sanders’ campaign besides giving money. He needs volunteers to knock on doors, make phone calls, host house parties and fundraisers, etc. Both monetary contributions and volunteer acts help spread his message and inform others about the change that is possible. We can all do something! The time has come to make our voices heard. This is our opportunity to end corruption in big banks, take action on climate change, stop our participation in needless wars, bring down Monsanto and the poisoning of our food, and return the power to make decisions to the individuals of this country. We can’t wait another 4 or 8 years, and we can’t sit around and hope for someone else to one day possibly fix these problems for us. We must be a part of the solution! Sanders is giving us that opportunity now. With 33 years of experience in elected office and consistent positions on policies since the start of his public service, he has shown us that he has both the knowledge, wisdom, and morality to lead this country in a much better direction. Here is his moving speech following the Iowa caucuses. We must turn this ship around! 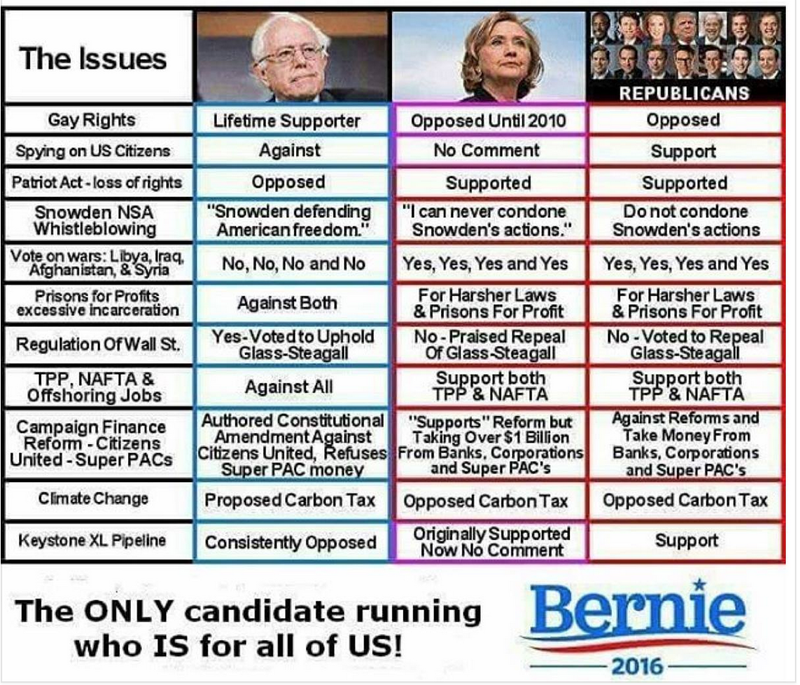 Finally, for anyone who has questions about his electability or questions on his policies, here are some answers.